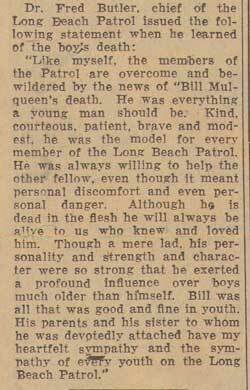 Below is a photo and the newspaper clipping from the Long Beach Chronicle, August 5, 1932 announcing the death of Bill Mulqueen. 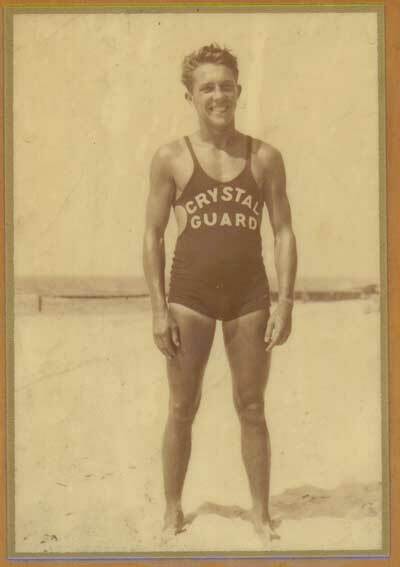 Bill was a guard at what was then the Crystal Baths. 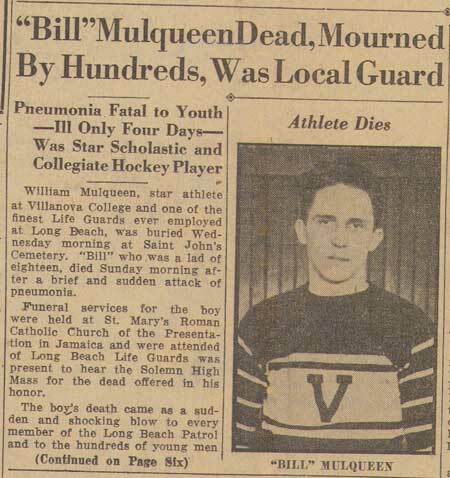 According to his niece, Bill had participated in the rescue of a priest and several boys accompanying him 4 days before his death. Doctors believed he had not fully recovered from a flu and the strain of the rescue further complicated his condition. Most likely he had taken water into his lungs during the rescue and this led to the pneumonia (sometimes termed "athlete's lung") which took his life. If anyone has any solid information on the rescue, or knew Bill personally and can add anything, please email me. Thanks to Kathy Gerardi for sending me this. Close this window to return to the Lifeguard page or click here to go to the Index Page.